Hello! Happy Thanksgiving! Can you believe it’s the end of the year and in a few short weeks Christmas and New Years will be here! Gosh, this year has flown by!! Well, it’s been 3 weeks since I first told you I was going barefoot with my horses. Too my astonishment, the girls are doing great and so is Te. I want to get into more detail with what I’ve been doing with their feet since pulling shoes and where we’re at now. This is probably the biggest change apart from pulling shoes. For years, I’ve been feeding a grain diet plus hay plus turn out on grass pastures. 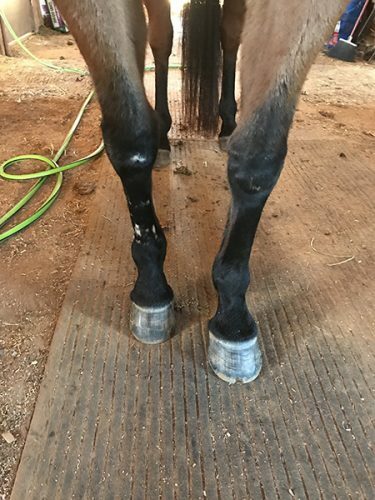 After reading Pete Ramey’s Book, Care and Rehab of the Equine Foot, plus watching a few of his DVDs, I realized that Diet plays a much bigger part in healthy hooves then I knew. So I decided to make a switch to a straight forage only diet for my horses and put them on a mineral supplement. I went from feeding a balancer feed to Timothy pellets plus supplements and minerals. As mentioned already, on top of switching my horses diet, I started feeding a mineral supplement called California Trace. What I realized through all my research, is that horses are lacking enough minerals and the right balance which causes their hooves to be unhealthy. Part of how you know a hoof is unhealthy is if you see thrush or cracks. Of course, those aren’t just the sign of a mineral deficiency, they can be from many other factors too. Lack of minerals is just one more thing causing them to be visible and hard to get rid of. If you’ve never read Pete’s article on “Feeding the Hoof”, I would highly recommend you read it….and the rest of his articles. They are full of valuable information that every horse owner should be aware of. Might I also mention, I’ve noticed a big difference in the girl’s coats since I’ve started them on the minerals. Both girls coats have a nice shine to them and Gracie has dapples! I never see her with dapples in winter, only in summer when her coat is short. Something that I felt was an issue with Gracie’s feet was the shoeing schedule I had her on. The farrier would come every 5-6 weeks but that just didn’t seem to be working. 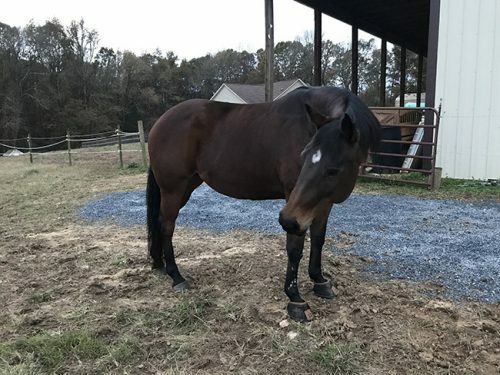 Her toes would get so long and then they would get trimmed back to where they started at before new shoes were set but the issue didn’t look to be getting better. It seemed like we were in a cycle we couldn’t break out of. In order to keep her toes from getting too long and to keep them from flaring/separating anymore, I needed to keep her on a shorter trim cycle. So I began doing trims myself every two weeks. Nothing drastic, barefoot trimming isn’t drastic, just making sure all sides were even, touching up my mustang roll, and removing any excess wall that wasn’t needed and would hinder the right growth. I have to admit too, I was a little afraid to be trimming myself but it’s been easy and fun. I’m not doing too much, just keeping it simple and in all honesty, I actually like doing it. This one is very very important, not just for barefoot horses but even horses with shoes. I actually didn’t know my horses had thrush when I went barefoot. I always would ask the farrier if they did and he would say no. When I would pick out their feet, I wouldn’t see black goo or smell anything, so I believed him. However, after posting in a group about my horses feet, quite a few people commented that I needed to be focusing on getting rid of the thrush. I was shocked. So that led me to start reading up on it more and that is when I realized they were right. My horses (all of them!) had thrush! There are plenty of products on the market to use for thrush but my favorite thrush treatment is Tomorrow. It’s actually a treatment for cows with mastitis but works wonders on thrush. Within a week, I started to notice the frogs getting harder, the thrush spots clearing up and looking better. It’s now been 6 weeks (I think) since we pulled shoes and only a few frogs still have a little thrush which I think was hard to kill because we kept getting a ton of rain. Now it’s drying up so that’s helping plus the diet change which is said to help too. I wasn’t too sure about putting pea gravel in the pasture when I first read about it but I did it anyway. I got a load of pea gravel and spread it out in front of my barn doors and water troughs. This is an area where I have a lot of mud, so it made since to put something down there. Plus, it would force them to walk on it which is suppose to help their soles and frogs. Y’all it did! Like, I saw results from this right away. The horses soles started to look better and their frogs started to get harder. I’m a true believer in the helping hand pea gravel has at creating a healthy hoof. I’m actually hauling in more pea gravel to put in other mud spots in my pasture and going to put it in the paths they make in each field so they are walking on it as often as possible. Highly recommend giving this a go if you have mud spots in your pasture. Everything you read will tell you that heel first landing is most important for hoofs to grow right. Not to mention, it’s proper movement for horses. However, when a horse has hoof problems, they tend to land toe first which can create problems. After pulling shoes (and very likely before pulling shoes but I didn’t know to look then) I took slo-mo video and noticed that Rumor was landing heel first. She’s my tough girl that has had no problem transitioning to being barefoot. Gracie was landing toe first. I wasn’t sure if this was due to the thrush in her frogs or the way she was use to moving but I wanted to do what I could do get her to land heel first. So I bought Easyboots for her and put pads in them. I used them any time she was turned out and moving. They helped. She went from landing toe first to landing flat when walking. Trotting is a different story but we’re getting there. Getting her to land flat on the hoof at a walk is a step in the right direction. 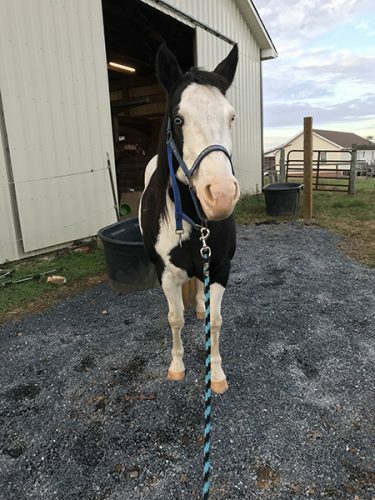 Do you have barefoot horses? Do you ride them in boots or are they able to be ridden (outside of an arena) barefoot?